There is a dedicated fan base for Digimon that has clamored for a new fighting style game. The All Star Rumble that has just been released by Namco Bandai looks to fill this hole. The game is able discount on all cylinders to provide fans and gamers with a compelling and fun title. The thing that one will immediately notice is that the character design seems ripped from the Digimon cartoon. After this initial fact players will be able to get their hands dirty and this is where the game truly shines. 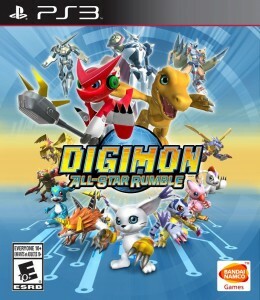 There is a control system that is used by Digimon All Star Rumble that will allow players of all ages the ability to win somewhat easily while taking considerable amounts of time to truly master the game. The title has distinct control patterns that have been programmed for each of the included characters meaning that one will feel as if they are stepping into the life of their favorite Digimon character – this isn’t just a set of reskins that a company is hoping will work but rather a well balanced and always interesting set of playable characters. To speak a little more about the balancing there is always a sense that one could go and win out against any of the game’s playable characters as there does not seem to be any really bad match ups. The game is available for the Playstation 3 and Xbox 360 consoles and is available from a wide array of online and brick and mortar locations. The video game would be a perfect purchase for a birthday party, as a holiday gift or for somebody that appreciates fighting games or the Digimon storyline. Keep an eye on the Bandai Namco website for additional information about the 2014 and 15 slate of releases.